Nvidia released a new driver for its GeForce video cards today that introduces official support for Windows 10 version 1809 which Microsoft released on October 2, 2018. Some users who upgraded earlier versions of Windows 10 to the latest reported issues that they experienced during and after the upgrade. Reports indicate that personal files may be deleted for some users and that there are also some graphics related issues that users experience. The new video card driver for Nvidia cards may resolve some of the graphics related issues that users experience after the upgrade to Windows 10 version 1809. Users who upgraded to the new version of Windows 10 already may want to update their devices to the new Nvidia driver if they experience issues after the upgrade that are graphics related. 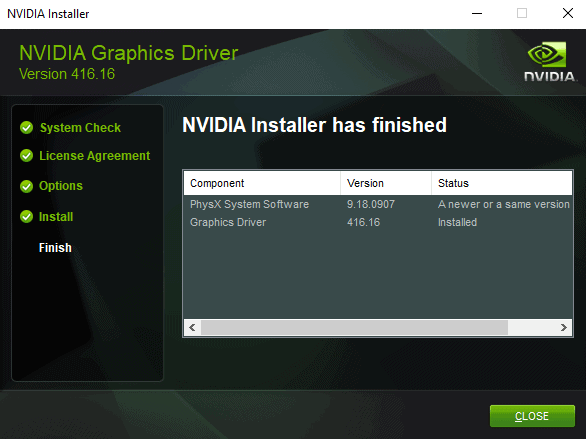 The updated driver is available as a standalone download on the Nvidia GeForce website and also as part of GeForce Experience's automatic update mechanism. The driver introduces support for the October 2018 Update for Windows 10 that Microsoft released on October 2, 2018; this includes support for DirectX Raytracing (DXR). Microsoft introduced support for DirectX Raytracing in the October 2018 Update for Windows 10 promising that it would deliver support for a "new class of real-time graphics techniques". The new graphics feature works out of the box on hardware that supports it according to Microsoft, and games that make use of it are not far away either. Black square glitches in Quake HD Remix with soft shadows enabled. Performance drop in Rainbow 6: Siege with temporal antialiasing. Driver error nvlddmkm on resume from S4. Missing 4K bitrate playback resolution when using USB-C HDMI connections. Mouse cursor shows brief corruption when hovering over links in Firefox. Two Surround related issues with Windows Defender Application Guard and Microsoft Edge. AV Receiver switches to 2-channel stereo mode after 5 seconds of idle. DPC watchdog violation errors when using multiple GPUs on motherboards with PLX chips. Crash of Windows Media Player under certain circumstances. Tip: use NVSlimmer to install only the Nvidia driver components that you require or use a manual method to do this instead. As always, make sure you block the installation of Telemetry as good as you can during installation and disable Telemetry that Nvidia installs afterward if something slipped by. Now You: Do you use Nvidia cards? What's your experience with these devices? I like Nvidia GPUs. I think they offer extremely good support for their products. I just checked out of curiosity, their 8 series (I mean the old 8000 series) GPUs had support for 10 years. From 2006 to 2016. I think most hardware manufacturers, mainly from the smartphone industry, and even software companies, like Microsoft, could learn a bit from Nvidia. I play Thief: The Dark Project With my daughter (she is 5.4), and she loves the game. It was the first game she saw when she was a baby, when she got older she started playing the game. I wanted to show her that Code “masterpiece” never dies. Martin… I hope you Air at. Always useful to have in case things go pear-shaped after the installation. Nvidia GeForce 418.81 WHQL driver.